Iranian President suggests that hard-liners opposed to making a deal with the West should go "to hell." Iranian President Hassan Rouhani had harsh words on Monday for hard-liners opposed to making a deal with the West over Iran’s nuclear program, saying they should go "to hell." According to the Associated Press (AP), Rouhani, who spoke to an annual meeting of Iranian ambassadors, called his hard-line critics "political cowards." "Anytime there is going to be negotiations, a handful say we are shaking. Well, to hell. Go and find a warm place for yourself. What should we do?" 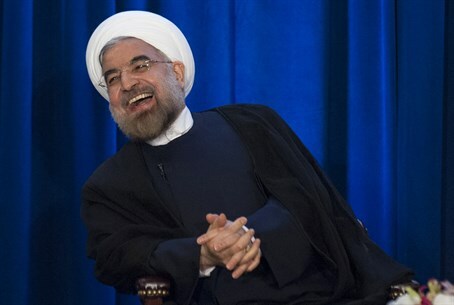 an angry Rouhani said in comments broadcast live on state television. Rouhani said his government will continue his policy of moderation and "constructive engagement" with the West. Iran’s hard-liners have been calling an interim nuclear deal reached with the West in November a "poison chalice" for Iran. They also organized a high-profile meeting last month to criticize Rouhani and the negotiators, saying the government has no right to accept limitations on Iran's uranium enrichment. Iran and Western powers are trying to turn the interim nuclear deal reached in November into a permanent agreement. The sides recently committed to a four-month negotiating extension through November 24, after they were unable to reach a permanent deal by a July 20 deadline. The accord is aimed at easing fears once and for all that the Islamic republic might use its civilian nuclear program to build an atomic bomb, something Tehran has always denied. Rouhani repeated Monday that his government seeks a "win-win" solution where both Iran and the West will feel victorious. However, hard-liners say they won't allow that to happen, setting up a possible political challenge to Rouhani's administration in the weeks ahead as negotiations continue. A deal could see the lifting of oil and trade sanctions on Iran, which seems to have toughened its position. Iranian Supreme Leader, Ayatollah Ali Khamenei, recently said Iran "needs" 19 times more nuclear centrifuges than the amount being offered by world powers. Iranian nuclear agency head Ali Akbar Salehi echoed Khamenei’s remarks, saying Iran wants to greatly expand its uranium enrichment program despite Western fears that it could be used to make atomic arms.